A recent report published by Infinium global research on load cell market provides an in-depth analysis of segments and sub-segments in global as well as regional load cell market. The study also highlights the impact of drivers, restraints and macro indicators on the global and regional load cell market over the short term as well as long term. The report is a comprehensive presentation of trends, forecast and dollar values of global load cell market. According to the report, the global load cell market is projected to grow at a cagr of 3.4% over the forecast period of 2018-2024. The load cell is a transducer that converts the applied force into the electrical signals. The magnitude of the electrical signal is directly proportional to the applied force. The load cell is mainly used to measure the applied force or to measure weight. There are various types of load cells are available that are categorized on the basis of precision, the direction of loading, shape of spring material, and other specifications. The rising applications of load cells in the healthcare sectors are driving the growth of load cell market across the world. Rehabilitation equipment, in-bed weighing system, medical pump testing, biomedical research and several other applications of load cells in the medical and the healthcare sectors are triggering the growth of the load cell market. In addition, the high accuracy of the load cell is likely to boost the growth of load cell market. The load cells are vastly used in the aviation and in aerospace industries for testing applications. The rapidly growing applications of load cell across various manufacturing, packaging and heavy lifting industry are also facilitating the growth of the load cell market. The introduction of new and advanced digital load cells across various industries are contributing to the growth of load cell market. Moreover, the ongoing development and advancements in the load cell technologies are projected to create several opportunities in the load cell market in upcoming years. Among the geographies, Europe is the largest region in the load cell market and is expected to remain dominating region over the forecast period. The vast uses of load cell across various end-use industries in Europe region are fueling the growth of load cell market in this region. In addition, North America is the fastest growing region in the load cell market owing to the growing demand of load cell from the healthcare, aerospace, and defense, oil and gas industries. The report on global load cell market covers segments such as classification, technology, and end-user. On the basis of classification the global load cell market is categorized into on the basis of the direction of loading, on the basis precision, on the basic shape of spring material, on the basis air tightness and on the basis outer shape. On the basis of technology the global load cell market is categorized into analog load cells and digital load cells. On the basis of end-user, the global load cell market is categorized into healthcare, oil & gas, agriculture equipment, aerospace & defense, automotive, consumer electronics and others. The countries covered in the North America region include the U.S., Canada, and Mexico; while Asia-Pacific includes China, Japan, India, South Korea, Malaysia, and among others. Moreover, Germany, U.K., France, Spain, and the rest of Europe are included in the European region. The U.S. drives the growth in the North America region as it is the largest market in the region. The Asia-Pacific region offers substantial potential for the market growth owing to rapid growth in markets such as India and China. The APAC region is projected to experience growth at a cagr of x.x% over the period of 2018-2024. The report provides profiles of the companies in the global load cell market such as Omega Engineering Inc., Honeywell International Inc., Measuring Instruments Co. Ltd., Flintec Group AB, Zhonghang Electronic Measuring Instruments, Vishay Precision Group Inc, Hottinger Baldwin Messtechnik Gmbh, Thames Side Sensors Ltd., Novatech Measurements Ltd. and Futek Advanced Sensor technology Inc. The report provides deep insights on demand forecasts, market trends, and micro and macro indicators. In addition, this report provides insights on the factors that are driving and restraining the global load cell market. Moreover, IGR-growth matrix analysis given in the report brings an insight into the investment areas that existing or new market players can consider. The report provides insights into the market using analytical tools such as porter's five forces analysis and DRO analysis of load cell market. Moreover, the study highlights current market trends and provides forecast from 2018-2024. 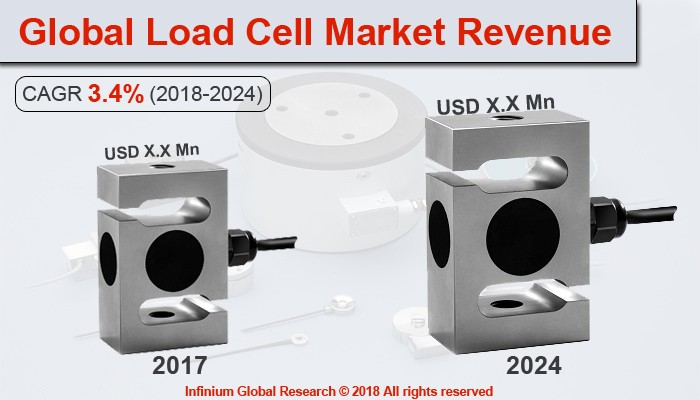 We also have highlighted future trends in the load cell market that will impact the demand during the forecast period. Moreover, the competitive analysis given in each regional market brings insight into the market share of the leading players. This report will help manufacturers, suppliers, and distributors of the load cell market to understand the present and future trends in this market and formulate their strategies accordingly.